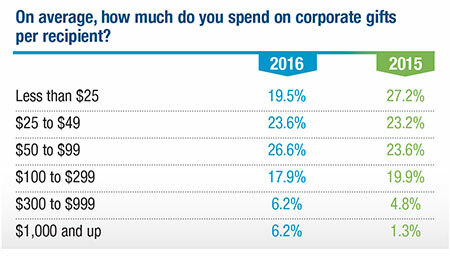 With the economy solidly shifting into “improved” from the last few years of “improving,” it probably should come as no surprise that businesses are spending more on corporate gifts (up to 27.4 percent from 20.6 percent) and giving them on more occasions (up nearly 37 percent) than they did in 2015. 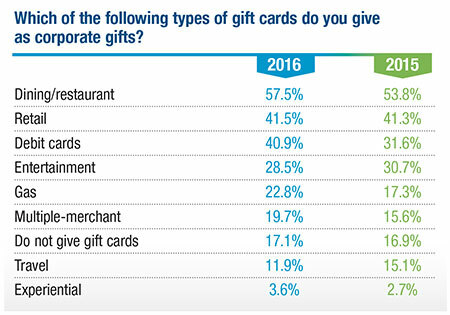 Nonetheless, the number of respondents who said their companies are sending gifts to more recipients is down very slightly (about 2 percent). That’s borne out by the per-recipient budgets for corporate gifts. The number of respondents who say their firms give out the most expensive corporate gifts — those costing $1,000 or more — more than quintupled, from 1.3 percent to 6.2 percent, between 2015 and 2016. Gifts in the $300 – $999 range are up almost 30 percent, from 4.8 percent to 6.2 percent. 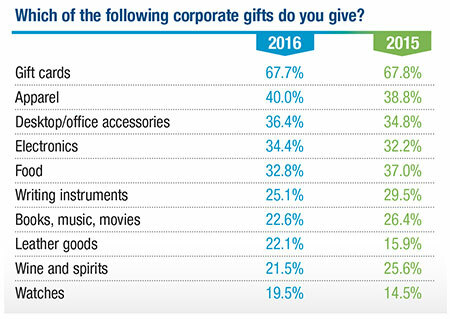 Only 19.5 percent of companies reported the smallest corporate gift budgets — $25 or less — compared to 27.2 percent last year, a drop of more than 28 percent. Are You Looking for the Most Convenient Way from HK Airport to Mainland China? How to choose the best promotional gifts to boost your business? Why Custom Earbuds and Headphones Can Boost Your Sales in Marketing? With following factory audit report,material compliance,related product certification and more.